I like to keep to myself so I usually don't see a need to make a project thread, but my brother is getting on me to make one (probably because he wants to post "wow looks nice" in it), and it would be good to get some free beta testing. I've liked this game since I first played it in 2008, but I didn't want to do any conversions for years because I didn't want to screw up something that seemed impenetrable at the time. But I have knowledge of almost the entire system inside and out (more than the players back in the day probably did thanks to Cheat Engine) so there's no reason not to do it. MONSTER is a game where you "shift" into modes that change how the character plays. It's like CvS grooves, but the difference is that each shift affects your command moves. I won't be supplying the actual changes for characters because the whole fun of monster is that you find out the differences as you play and pick up the one you think works best. It's a simple game with a small movelist so it allows for it to be very intuitive and encourage experimentation. Monster makes use of effects drawn and rotated in game. To recreate this, I chose to make use of the interpolation features in 1.1, even though it's not a widely used build (as far as recall, I haven't made note of any reactions to it since 2015). Ripping them with proper palettes is difficult with my current method for textures. 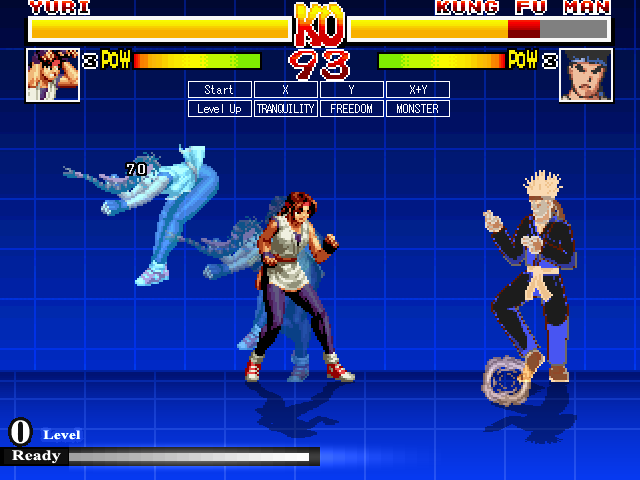 But also Mugen is for wacky characters in different styles. 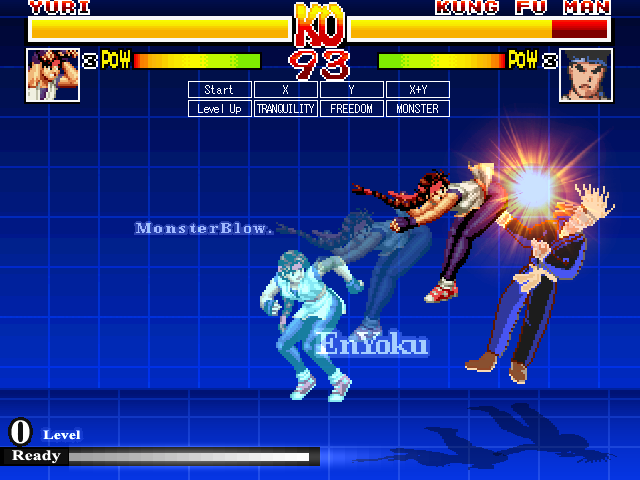 = MONSTER is a single instance game, unlike Mugen where each round is a separate instance. 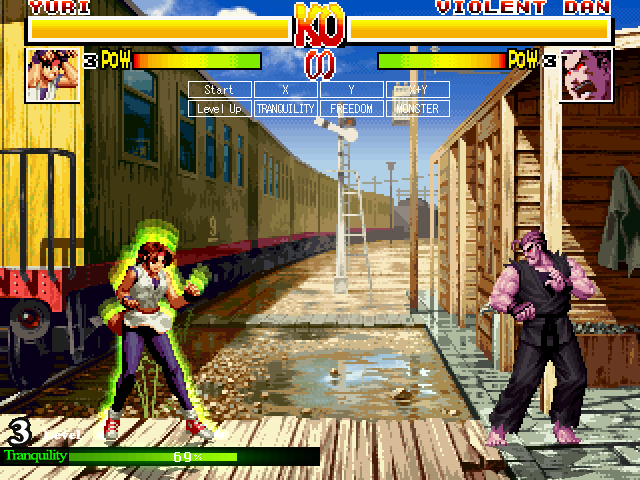 After a KO the loser gets back up immediately and the activated shift is supposed to carry over; however, due to the problems of instancing you lose out on the shift because Mugen takes roughly 3 seconds to end the round and start the next. A shift only lasts 10 seconds so you lose out in the end. I have made it so if you're in shift when you win a round, you will start the next needing to fill it (you would most likely start the second round having to fill it in most situations anyway). If it's full, you keep it. This is also a problem of scaling. I cheated in a very major way by animating the bars for smooth scaling instead of modifying explods as I didn't want chunk by chunk scaling, so the animation would restart in the next round while the number would remain the same. I want the shift to carry over, so this might be fixed in the future, but for now it is as it is. = Proration rates are correct, and I can confirm because I've calculated the proration myself for every character and the only thing that would make it perfect is getting access to the formula itself; however, the current method I have is bloated and needs an overhaul (a manual varset in each attack state based on current combo number and current proration percent), though I am currently looking for a way to correctly apply nonpersistent variable calculations (my original method was much closer to how the game formula works, but it applied the calculation every tick because lol -2). The current method also has a 90% success rate, with a few bugs that either don't apply initial rates (they show 00% when displayed) or don't apply successive rates. 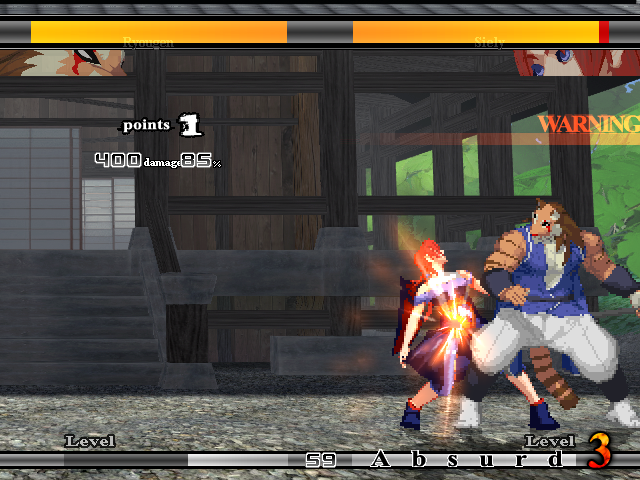 = Damage display is currently a work in progress. I've based it on (9)'s MBAA display since his works might be the only characters I know of that have this, but only in the actual explod functions (mine isn't as good! I need 4 variables whereas he gets away with 3). It does the job, correctly showing damage and proration values, but it still isn't properly animated (it should fade out). = POWERBREAK IS IMPOSSIBLE OUTSIDE OF A FULL GAME. Seriously, point based systems that compare P1 and P2 variables are something I don't want to bother with after implementing Judges' Decision from Buriki One. This is very tangential but where can I find info on the source game? alright it took a while on my 156kb internet (which is why I just posted pictures earlier), but here's a quick explanation that also shows why MONSTER is fascinating. I always wanted to play MONSTER, but I never found a link to it. Well hopefully I can give a good approximation of it then! 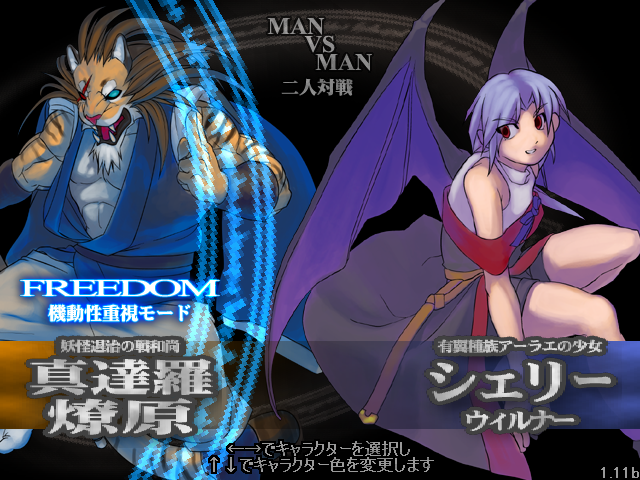 I actually got my copy years ago from a source of dubious legality that hosted doujin games—there were a ton of fightermaker2000 games there that I snagged, though the only one I ever shared was GensouSenki as it was just a 2ch meme game—and when I did get it, it was the 1.01 I currently have when 1.11b was already out. THOUGH, when I actually got into it, ShoK stopped making it. This was after Ancient Cline was announced, and before it became vaporware of course. 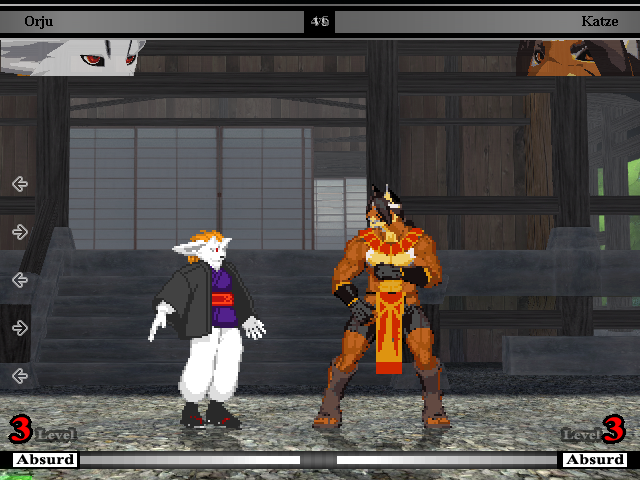 As far as I gathered over the years, ShoK was apparently hired by Arksys and someone in the fighting game furry community (I'm not exaggerating this by the way, MONSTER had a sizeable furry following) requested the source code from ShoK to continue development, and he was working on it but apparently he got cancer at some point in—don't quote me, I haven't looked at the facebook posts about it for YEARS—2010ish(?) and any possible development completely stopped. So I haven't played 1.11b, but I don't really even consider the game "done." Everything outside of the actual gameplay seemed so rough, even for a one man job, the 2.0 would have been probably closer to a published game. 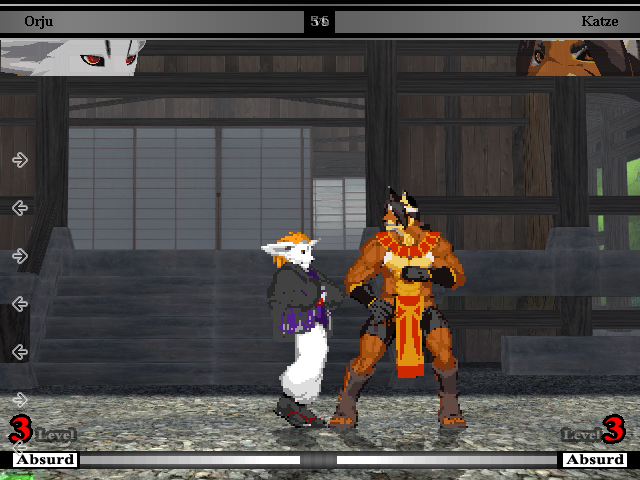 For example, here's Orju's standing and walking sprites as of 1.01. The textures aren't complete. Maybe they were in 1.11b but I don't know. This actually is part of the reason why I won't bother trying to rip sprites, as my version too old for the fidelity I'd want. 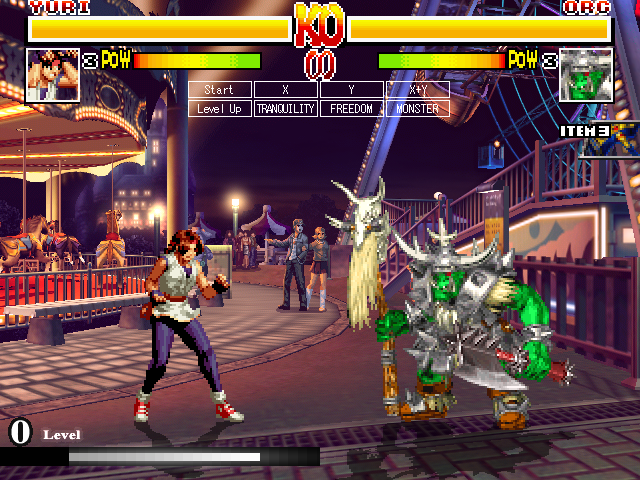 I think there are some actual MONSTER conversions for mugen out there, Aleksander and Maya or Siely (I don't recall, they sort of look similar at a glance), I saw them on the database when Nunor was updating it; however, I don't know how accurate they are, I've never downloaded them(!) because I only liked Ryougen, Delga, and Orju as characters. Fixed my proration bugs by creating a helper for it as opposed to manual setting, where I can't multiply it by a required percentage, and the -2, where the result is persistent. it still requires a lot of manual varsets through calculating the current hit number through my combo correction, but unlike my last two methods it's reliable, updates in real time, and correctly modifies the damage dampening rates. With this I'm maybe 70% done with all the system stuff, and I can probably throw out an alpha for testing by the end of the week. In other news, yes, that is Yuri, not Shion. There were some system attributes that I couldn't correctly implement in that character's current state, and I had Wuwo's Yuri rips sitting on my computer for some reason, so I threw this together in the last few days to make the necessary changes. 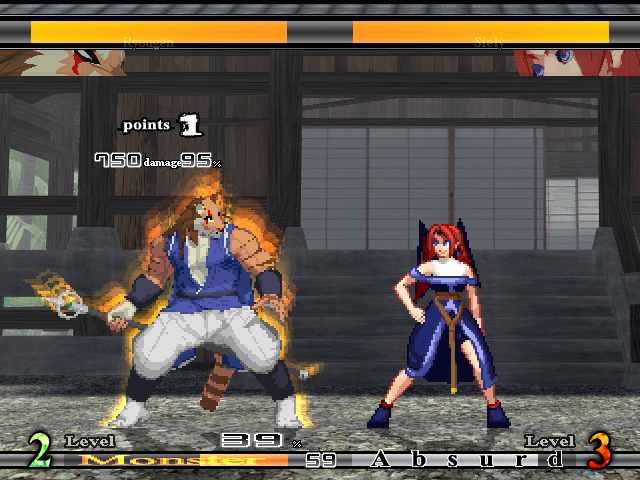 I luckily play only Kyokugenryu characters in KOF, so I know Yuri well enough to make a decent conversion. I managed to grab a copy as the link is floating around Youtube. Is it legal to share? Since 8105 graphics no longer exists as a doujincircle it might be classified as abandonware, so technically illegal but no clue whether ShoK even cares about it floating around or not. Out of curiosity, what version is it? If it is 1.11b I would like it myself, if only to get a better idea of what the changes were from 1.01. Never mind, I actually just stumbled upon it randomly right now while looking for legality info. That being stated, I'll check into this and see what I can find and I'll make some notes on the differences between versions. Overall, I prefer pre-1.11b gameplay. What made MONSTER interesting to me was the use of shift to gain meter. Thus, I'll stick with 1.01 for the system, but I'll grab the newer effects. I believe I also have 1.11b, as my copy came with "update_mnstprd_111b" patcher which I used and I assumed it worked. I haven't really dug in yet tho. I kinda wanna find an old copy for collection purposes. In MONSTER training mode allows you to change shifts at will, even when shifted! I wanted to do the same for the conversion. Not only does it make testing easier, it makes the moves easier to compare. To access it, play training mode normally, or start the FIRST ROUND with MAX POWER during INTROS (The power gain will set training mode). This is important: you will not gain power during the fight, and after the first round you will lose your ability to set training mode. I always want a second opinion. 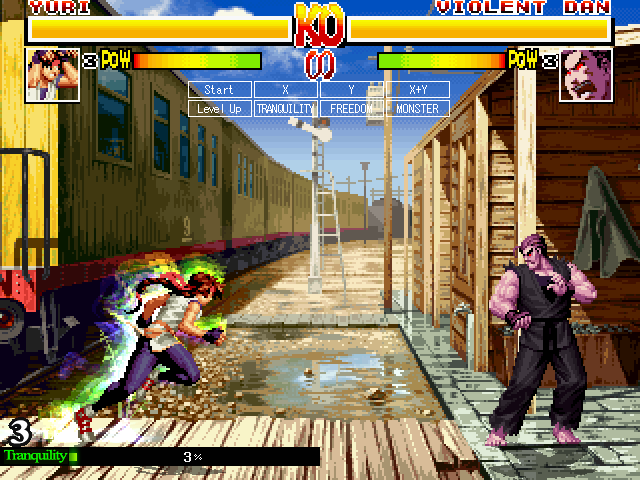 Oh, I forgot because I placed it in the screenshots thread earlier today for feedback, but here's an image of the training mode so you know you're not lost. 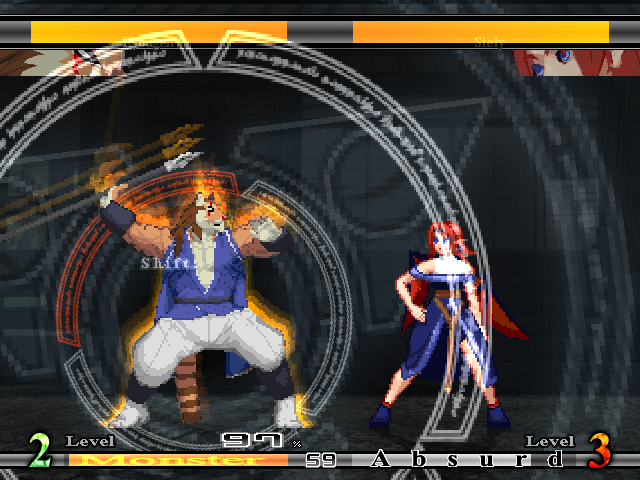 It's an outdated version, as I later changed it so that shift is max at round start, but it's relevant enough. I haven't really touched any of the shift velocities since I made the state itself, so mine weren't even correct to begin with, but this is a boon in terms of creating more comboability. Most normals and specials seem to cancel into shift, though obviously monster blow doesn't because it uses your level completely. This is starting to look more like a combination of 1.01 shift mechanics and 1.11b gameplay, but I haven't really dug into comparing the juggle systems so I can't tell. I might shelve the old mechanics for the new ones if I like them better. I might look into making the powerbreak, because IT IS an important mechanic, I'm just unsure how I would implement it at this moment. I'll probably be adding a config in later versions that will allow things like this to be turned off. Maybe I can go full Kame and give you the option to use 1.01 or 1.11b shift. 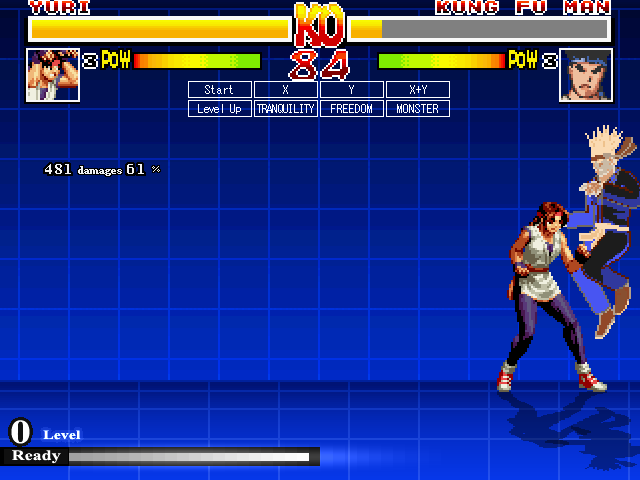 I have also corrected some explod and helper issues that appeared in the alpha, mostly related to Ko'oh ken, and tweaked animations for several freedom moves. There's still a lot that needs to be done fine tuning with hitdefs, as they're all fairly the same at the moment, but I'm working more on figuring out some system bugs related to my damage display and the supers. 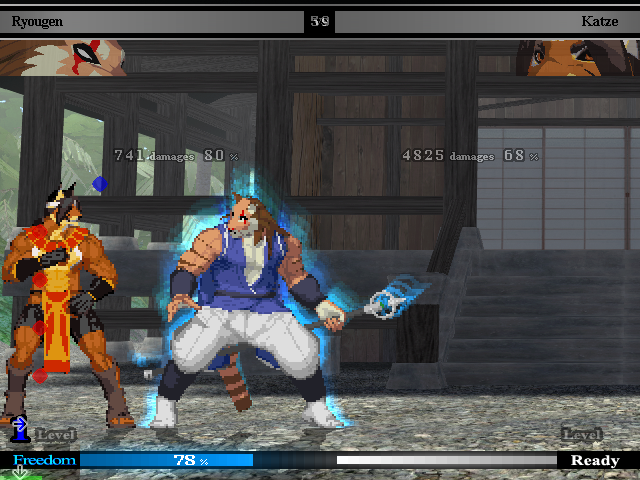 which also allows for the neat blue afterimage sitting over the glow like in the game! What's left to be done seems to really be just effects and hitsparks, but something doesn't feel right to me in how it plays. 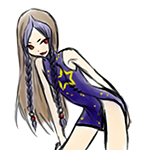 System wise it seems perfect, but I can't seem to find chains or links in XI Yuri's moveset that are even close to those in Monster. My keyboard doesn't actually work though (I can't use crouching attacks! ), and I don't play fighting games with a keyboard anyway, so who knows.